Hi guys. The loss to the All Blacks on Saturday gave us two conflicting emotions. The Boks played brilliant rugby but then made silly mistakes to lose the match. It is like if our mother-in-law drive off a cliff in our favourite car – we are happy, but we are also sad. There is talk that the substitutes cost us the game but I am not sure if that is the case. 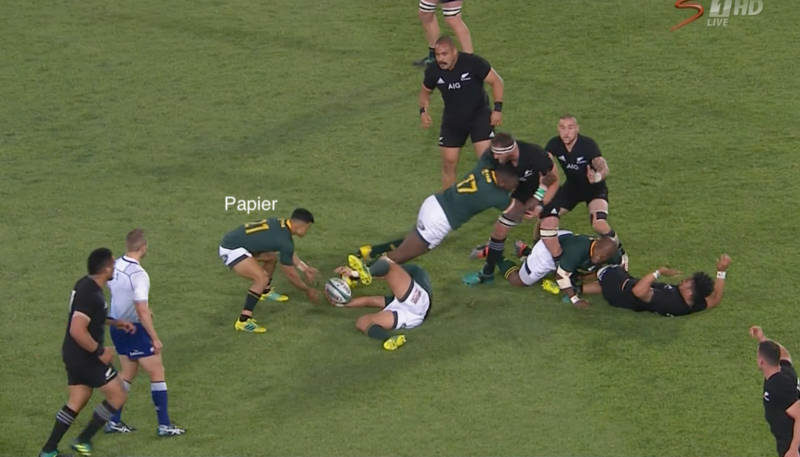 Certainly the Boks lost focus at the end, but that can also happen if players is tired. So do you swap players or not? And a closer look actually show us that errors was made by the subs and the other players, so I think it is more a case that the team as a whole did not have the right mindset to “close” the game. Let us start by looking at a moment from earlier in the match. There is ten minutes left and the All Blacks is showing the Boks right here how they will win the game. Simply, they started contesting heavily at the Bok breakdowns. The result was that they won turnovers at crucial times at the end because we did not protect the ball. Above, the prop Tuungafasi get to the ball before our cleaners Louw and Du Toit and win the penalty. It was a warning shot that the Boks did not listen to. Now In the picture above we get to the critical chain of events. There is just over 3 minutes left. The Boks is leading the game and they have possession. You MUST be able to win from here. This is where on-field leadership and calm decision making is needed. Pollard carried the ball up, Beast cleaned excellently, and now we can see Papier is arriving at the ball. Everything is set up for the Boks to slow the tempo, set their carries, and run out the clock. Except above we see that Papier decide to go for a break. In the normal flow of a game this will maybe be fine, but for reasons we will soon see this is the wrong time to do it. The space he saw closed very quickly and he almost get stripped of the ball by two defenders. Such is the pressure nature of Test rugby. This moment above is the first domino to fall. The Boks manage to save the situation, but as we see above Snyman must now play scrumhalf. This is the second domino to fall. Because what we want when we are running down the clock is for our 9 to organise play. He have three specific jobs: he must slow the tempo, organise his forwards and set the right targets. 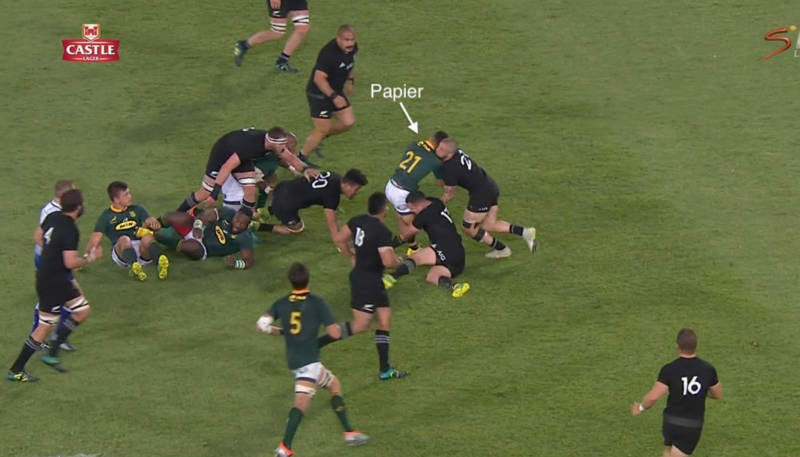 Instead Papier is at the bottom of a ruck, and nobody else take charge of the situation. Above we see that the forwards has not been set properly. 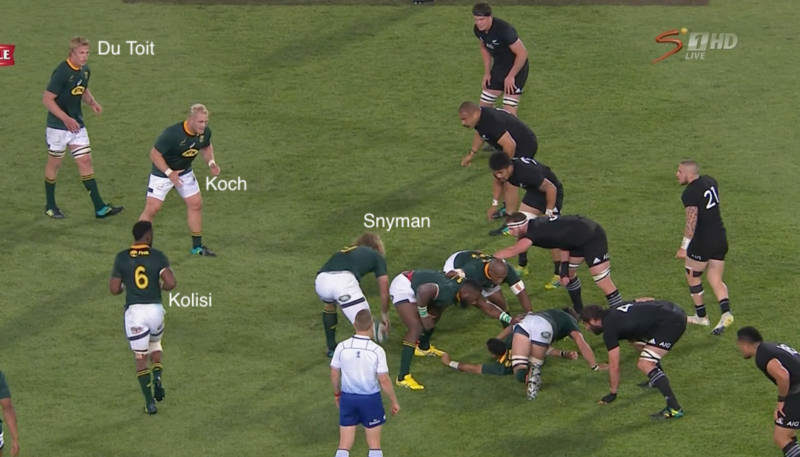 Koch will receive the ball, but the only support close to him is Du Toit, with Kolisi still jogging into position. If we want to protect the ball at all costs then we want two forwards latched on to the carrier. As Koch carry the ball we see another domino falling. His body height is not low enough, so he can not dictate the terms during contact. It is harder to fall in the correct way, harder to do the extra “fight” on the ground, and harder to place correctly. But even more important to note here is that when you running down the clock the carrying player must not carry for gains, he must carry for ball security. 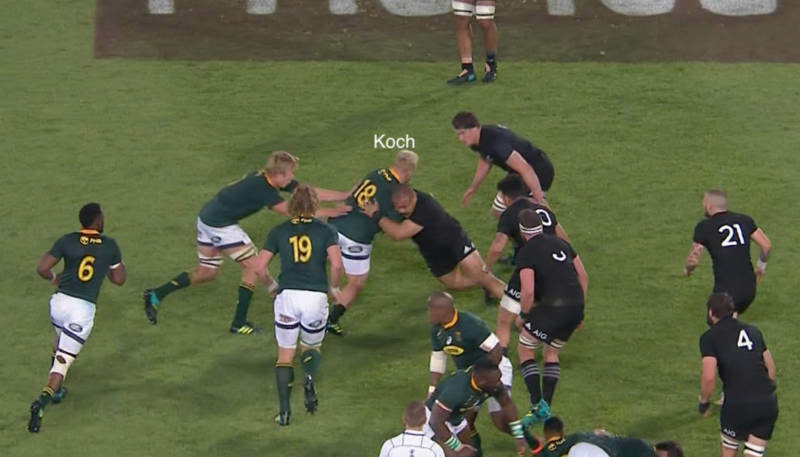 The correct thing for Koch to do at this stage of the match is to prioritise going to ground sooner, and on his terms. But he pump his legs and go deeper into trouble. We can see above that Pieter-Steph falls down first, and then Koch fall on top of him. This is not ideal – it must be the other way around! 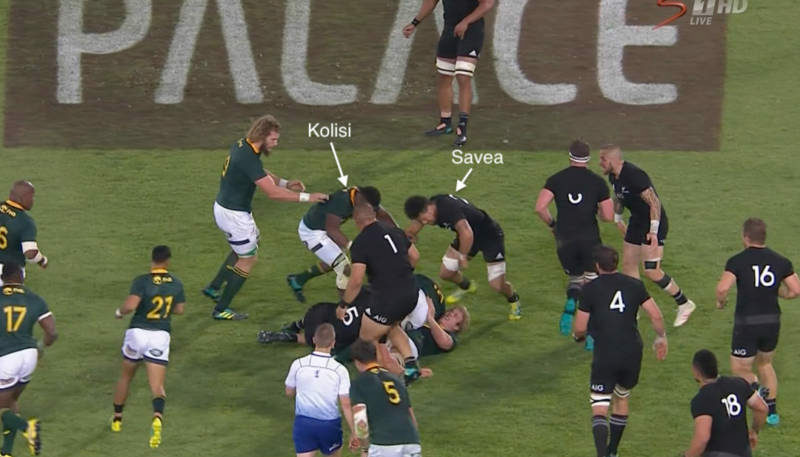 And the final nail is that in the absence of the sealer Du Toit, Siya is one millisecond too late to beat the excellent Savea to the ball. The All Blacks will get a penalty when Koch don’t release, kick for the lineout, and score to win the match. There many reasons I wanted to talk about this moment above. Firstly it is just interesting to see the tiny margins that can win or lose a test match. Secondly I wanted to talk a bit about technique and the way we must play if we want to truly protect the ball and beat the clock. I also wanted to make a mention of the Springbok naiveness and perhaps lack of leadership and organisation as the game go down the home stretch. There is a specific gear a team must go into if they want to close out a game, and the Boks did not go into that gear. 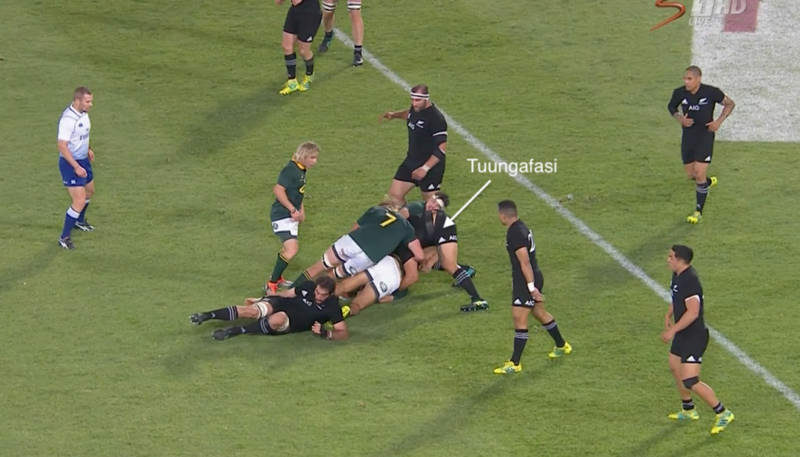 On a tactical level as well, the All Blacks was starting to target the Springbok rucks but the players did not adapt. In a match with many turning points, this for me was a key moment because the Boks was right on the doorstep of victory. So well done to Rassie and the group for how far they have come this year. This was a hard lesson to learn, but I hope it is one that they never forget. Nee oom – Boks should take more from loftus loss than Wellington win. When was last time anyone seen any AB team dominated like that for 65mins. They were totally toothless. Had no ball. It was not only 30-13 on the score board but 25 % possession and territory stats for ABs. Worse they didn’t even look like causing any threat. But that was 1-way traffic. I do not personally like identifying one or the last moments that let to a loss. Kolisi for me was the biggest problem in the Oom illustration. As said in other post the fact that he is not a fetcher means he is there to clean out and slow ball down at ruck time. He failed to do so and if he was with Du Toit the ball may as well would have been secured. I also tend to disagree with the Oom statement to play the clock down, I do not like it at all, too little times at all levels this work. I like the fact that you play your normal game, Papier breaking out is not the issue but rather that he may not have communicate properly so that his support players. But you can take a few things and talk about it and what they should have done…the fact remains they need to make sure not to make the same mistake again. Ja agree – actually thought papier was looking quite sharp. He looks good. Also agree that there are different kinds of opensider roles. Kolisi more of a linking openside. Marx and Vermeulen seem more effective at winning turnovers than any other players in SA, that the play at 2 and 8 who cares. Seems to me that velleman is the only real fetcher openside in brussow or pocock mould. When Brycie talks of this great balance that all the teams supposedly have – which SA team has an out-an-out fetcher anyway? Certainly not the sharks and I’m not sure MvS is so prolific either. Sam Cane us fantastic but it’s his allround game rather than what he does on the deck (where he is good too). I don’t think he’s a specialist fetcher either but he is an outstanding opensider. @cab: The law changes the beginning of the year has basically nullified the traditional fetcher role. Opensiders have to adapt and on top of that game plans now leave the no 8 in the middle 9f the field with the flankers operate 8 my from the sidelines in. That is why Pocock is still able to do it as an 8. 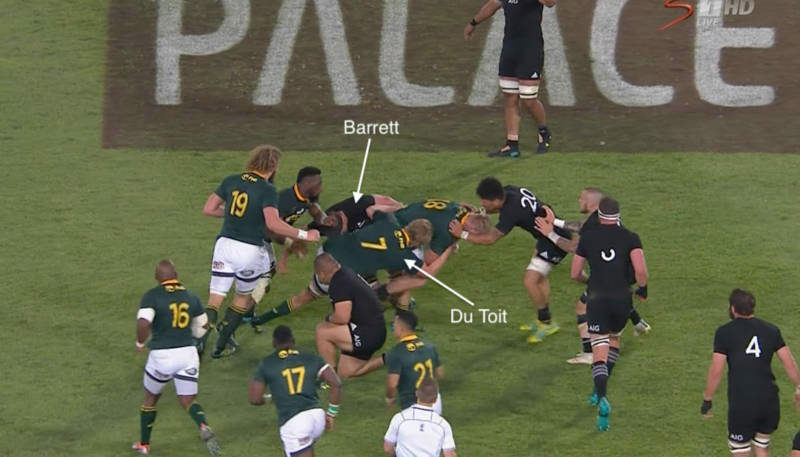 People not understand8ng this is why Kolisi is being criticised for standing on wing. Du Toit does the same. I attended their tra8ning in Br8sbane. It is the game plan not the players choice. All Blacks have been doing it for years with McCaw and Reid. DJ – Ja tbut ppl keep saying the law changes have made the fetcher obsolete. Not so sure when pocock pretty much single-handedly kept oz competitive v bokke. Was killing Boks at breakdown. Think you right that erasmus commits less to ruck, and maybe no 8 plays centerfield, but still the actual fetching skill itself, v few have and it is v effective. Vermeulen fetches well which lends support to your theory, but then so Marx and Itoje also win a lot of turnovers. I see brussow signed for Northampton this year. Dunno where he’s been but be interesting to see how he goes. He was outstanding. What the guys from The 1014 Rugby also picked up that Boks have two man tackle with PSDT or Kolisi on their back cleaning out.